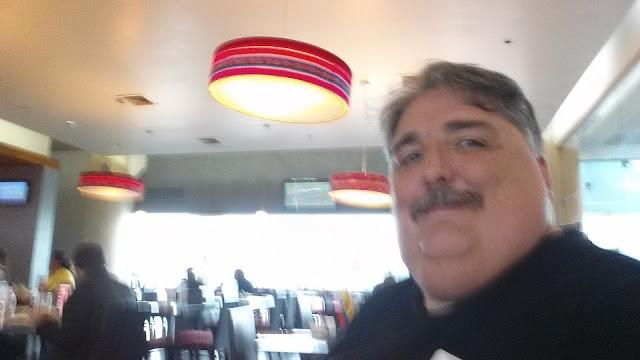 At the Lima airport, on my way back, on August 3rd. So, looking back, how was the trip? Obviously, it was excellent in all the ways that matter: time with family and friends. Did I do or accomplish all that I wanted? Yes, mostly. Liz and I had our amazing meal at Central, and the fun pachamanca gathering at Diego's new home. I did get to celebrate my birthday with the extended family and I was able to make it to Toti and Marina's anniversary celebration, even though I was not able to dance. As for books, I had a small list, and I got them all, so I'm good on that front. Unfortunately, my ability to get around and do stuff was curtailed by the injury to my knee, which kept me practically house-bound for a couple of weeks, so I didn't get to a couple of exhibits and talks that I wanted to attend, for example. I did have on my list for the trip getting to know the Lima craft beer scene better --or indeed, at all. I did know the Barranco Beer Company already and Cerveza De Tomas already --neither of which I was able to return to, despite my wishes-- but now I wanted to get to know more of the offerings, and if I could, installations, of other breweries. Altogether, I tried twenty-seven different Peruvian beers on this trip. That alone signals a seachange from when what was available were a smattering of offerings from Backus & Johnston and Cerveceria del Sur, being principally lower or higher quality variations of the same type of golden or dark lagers. I did not get to visit Cerveza Magdalena's brewhouse, despite having a personal invite to do so, due to my leg injury, but I did manage to tour Nuevo Mundo's brewhouse and attend the soft opening of their tap room, which was a lot of fun. I also discovered the Hops brewery. It is nice having a brew-on-premises brewpub so easily accessible from San Felipe. So, all in all, it was a good trip --which, but for my knee issue, could have been a bit better-- and I am already looking forward to next year.